Leaders of the San Diego County Democratic Party voted 58-4 to call for the resignation of Kevin Beiser from the San Diego Unified school board amid allegations of sexual abuse and misconduct that surfaced this week. The Central Committee’s vote in favor of Beiser’s resignation from the District B seat came after a discussion of the allegations made against him. The party also invited Beiser to attend the Tuesday night meeting, but he declined, according to party chair Will Rodriguez-Kennedy. The suit also alleges that Mock failed to help the anonymous victim when he was being abused at the couple’s Serra Mesa home. Further reporting by Voice of San Diego revealed that three other men corroborated similar interactions with Beiser in recent years. All four alleged victims were locally involved in politics in some way. Local Democratic Party officials condemned Tuesday’s initial reports of Beiser’s alleged sexual misconduct, but pumped the brakes on calling for his resignation until a vote could be taken. 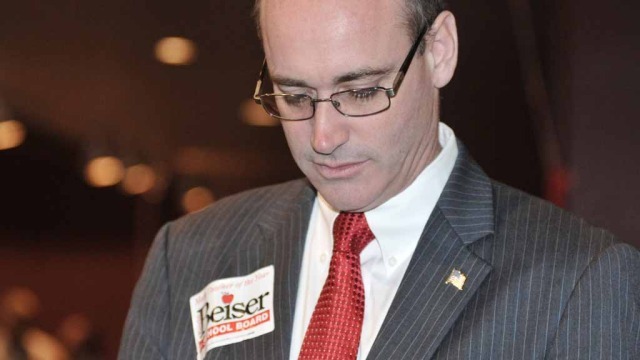 With the vote, the local Democratic Party joins a rapidly growing chorus of local political officials, groups and LGBTQ community leaders to call for Beiser to step down. In a statement issued Tuesday, the joint group said: “As LGBT elected officials who are committed to changing the overarching cultural and political climate to prevent sexual harassment, we want to ensure that every complaint is fully investigated and appropriately decided. Beiser, elected to the school board in 2010, is a math teacher at Castle Park Middle School in Chula Vista. He has also filed to run for San Diego City Council next year in District 7.